The mask designed by 10 years working experience team. High transparency mask can deliver the clear image and keep the rich color of dance floor led screen. PH8 Outdoor SMD Dance Floor LED Screen adopted hard-wearing acrylic mask which can be treaded directly. Redesign iron cabinet enhanced the structure of load-bearing. Load-bearing up to 1.5 T/㎡.The base can be adjusted from 0.6 to 1 meter. 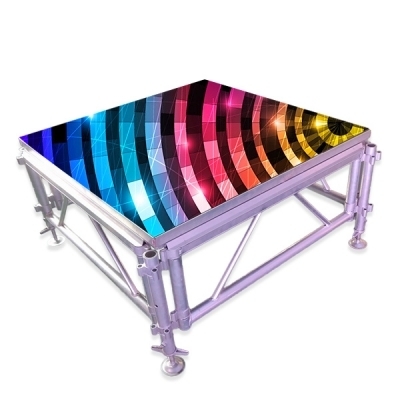 PH8 Outdoor SMD Dance Floor LED Screen can be installed directly without and stools. It is very easy and fast. The cabinet can be disassembled individual which is easy and fast for install and maintenance. Modular design is the special structure for dance floor. PH8 Outdoor SMD Dance Floor LED Screen can be used for dance floor and can also use as outdoor normal led display screen. Special heat dissipation space design and standard iron material can help heat dissipation fast and make led display run well. High gray scale ensures good consistency even in low brightness. It can keep a very excellent gray scale performance even lower 20% brightness of entire screen. IP 66 protection rate make led screen features anti-dust and waterproof which protect led screen run well in any harsh environment. Dans pisti led ekran sahne, bar, eğlence merkezi, alışveriş merkezi ve tiyatro gibi yerlerde kullanılabilir. Zemin dekorasyonunda yeri doldurulamaz bir üründür. Güçlü, dayanıklı, kesintisiz ek yeri, çok yüklemeli ve özel ısı dağılımı kanal özellikleri, her uygulamada iyi performans sağlar. PH6 Indoor SMD Dance Floor LED Screen adopted hard-wearing acrylic mask which can be treaded directly. Redesign iron cabinet enhanced the structure of load-bearing. Load-bearing up to 1.5 T/㎡.The base can be adjusted from 0.6 to 1 meter. PH6 Indoor SMD Dance Floor LED Screen can be installed directly without and stools. It is very easy and fast. PH6 Indoor SMD Dance Floor led screen can be used for dance floor and can also use as Indoor normal led display screen. Thanks for watching our product video, more product introduction, install and operate teaching lession welcome to visit our "Video" webpage or our YouTube channel "Optokingdom LED". PH5 Indoor SMD Dance Floor LED Screen adopted hard-wearing acrylic mask which can be treaded directly. Redesign iron cabinet enhanced the structure of load-bearing. Load-bearing up to 1.5 T/㎡.The base can be adjusted from 0.6 to 1 meter. PH5 Indoor SMD Dance Floor LED Screen can be installed directly without and stools. It is very easy and fast. PH5 Indoor SMD Dance Floor led screen can be used for dance floor and can also use as Indoor normal led display screen.